ABAP skills are still in high demand, and they’re not cheap, which can make creating scripts for SAP’s Legacy System Migration Workbench (LSMW) a costly business. And though LSMW might work well for single instance data migrations, it was simply not meant to be the hammer that IT departments uses to nail every integration scenario – but there is a better alternative for more complex data integration needs, as Clinton Jones discusses here. We recently pulled some usage statistics and found that in the last five years alone, Winshuttle customers have uploaded or maintained over a billion SAP records using the Winshuttle Studio Transaction module spanning hundreds of different SAP transactions from MM01 through FB50 and more obscure transactions. You can find out what automating an SAP transaction with Winshuttle Studio might be worth in time savings by looking at Winshuttle’s ROI calculator. 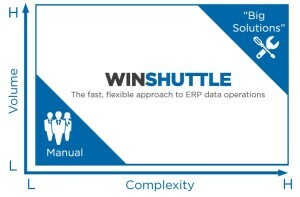 With Winshuttle, your script is completely portable, and can be embedded directly into the workbook by any user with the workbook and a Winshuttle Runner or Winshuttle Studio authoring license and SAP credential, allowing you to push, pull and change SAP data for a defined scenario. No ABAP changes, SAP authorisation changes or transports or SAP change management is necessary in order to get started with working with SAP Application Data from an Excel environment almost immediately. This article is sponsored by Winshuttle. Clinton Jones is a Director for Finance Solutions Management at Winshuttle where he has worked since 2009. He is internationally experienced having worked on finance technologies and business process with a particular focus on integrated business solutions in Europe, the Middle East, Africa and North America. Clinton serves as a technical consultant on technology and quality management as it relates to data and process management and governance for finance organizations globally. Prior to Winshuttle, he served as a Technical Quality Manager at SAP and with Microsoft in their Global Foundation Services group.